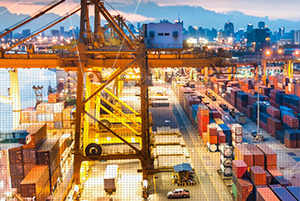 As Intermodal Europe 2015 gets underway in Hamburg, Germany, industry experts are gearing up to discuss hot intermodal supply chain issues such as growth and consolidation in the international container market, rail freight infrastructure, new intermodal networking approaches and future reefer machinery designs. Speakers of note include executives from corporations such as Maersk Line, European port authorities and container owner association representatives. Port congestion is one topic guaranteed to take center stage as cargo volumes are expected to increase around 3.6% in 2016 – in line with IMF’s global economy growth forecasts. This phenomenon is largely due to daily irregular discharge and load volumes caused by natural elements affecting ship schedules. Early in 2014, nearly a third of more than 9,900 vessel arrivals due at Northern European ports were off schedule according to a report issued by Dynamar B.V. Add to that growing vessel sizes, and how very few container terminals have been purposely-built to handle Ultra Large Container Ships (ULCS) over 10,000 TEU. So while this problem cannot be fully prevented, increased crane automation can play an important role in the attempt to achieve better terminal utilization. With remotely-controlled crane automation, terminals are expected to increase hourly and daily move volumes. Another important issue to be discussed is how Machine-to-Machine (M2M) and Internet of Things (IoT) technology is changing the traditional port landscape. Faced with limited space for expansion, ports worldwide need to find new ways to minimize the time containers spend at port locations. The port of Hamburg is in the forefront of creating a connected port environment by making sure that every component in the supply chain – ships, trucks, people, cranes, bridges and traffic control systems – is communicating with each other at all times and being constantly updated to reflect status changes or potential problems that need to be addressed in real-time. This results in trucks reaching their destinations faster, and drivers being informed of unloading locations more quickly, which decreases wait times and optimizes hours of use. Cloud technology is also being used by shippers to improve traffic flow and react more efficiently to everyday challenges. In line with the optimized future of containers are smart intermodal tracking, monitoring, protection and control solutions that translate into bottom line savings. For example, ORBCOMM remote monitoring solutions enable companies to reduce the number of manual inspections required to ensure integrity of refrigerated loads and proper genset operation during a long-haul rail trip by 64% and save millions of dollars in inspection costs and fuel bills. The GT 2300 self-powered intermodal container tracking system with cellular communications and GPS, which provides valuable insight into the status, movement, loading and unloading of container operations. Reefer container monitoring solutions from WAM Technologies, which was acquired by ORBCOMM in October 2015, featuring devices with embedded cellular communication designed to track, monitor and control refrigerated containers globally. Intermodal Europe 2015 is the world’s leading exhibition and conference for the intermodal and container industries and covers all areas of container, transport and logistics across road, rail and sea. The 40th anniversary edition is being held at the Messe (Hall A1) in Hamburg, Germany from November 17 – 19. Going to be there? We’d love to meet with you. Schedule a meeting with us.